As Apple launched the first subscription app for iPad with News Corp., Google announced catchup steps for Android: new "Honeycomb" tablet support, a new web app store, and new in-app purchases all along the lines of what Apple delivered a year ago or more. But the next wave of Android tablets are far more like Microsoft's Tablet PC than Apple's streamlined, ultra simple iPad. 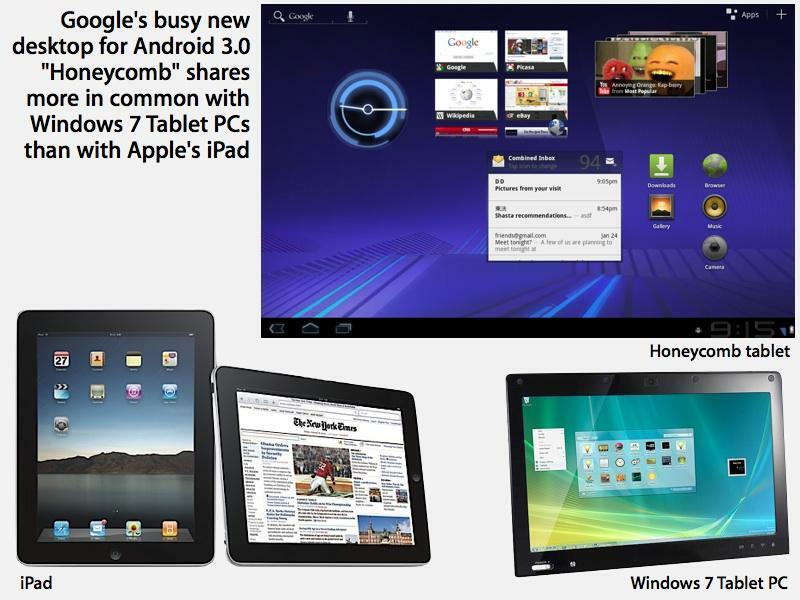 On Wednesday, Google previewed its upcoming, tablet-oriented Android OS 3.0 Honeycomb. The new release runs existing Android smartphone apps, but is intended to enable a new class of tablet-sized apps, just like last year's iPad, except that iPad launched with hundreds of prominent app titles and has since generated a library of more than 60,000 iPad-optimized apps. However, unlike the iPad home screen, which served as a larger version of the iPhone's, Google has designated the home screen of Honeycomb tablets to serve as a dense array of widgets spanning multiple pages, more like a PC desktop, with a lower "System Bar" containing app switcher controls and a taskbar (called "notifications and system status"), an upper "Action Bar" with search and app launching controls, and a series of virtual desktops, each containing a configurable Dock-like strip of app icons below a series of floating panels that can present media playback controls, live inbox and calendar items, stacks of ebooks and youtube videos, and other user configurable mini-applets. This should make Honeycomb tablets more akin to Microsoft's Tablet PC than Apple's iPad, and attract a similar audience of users. Apple's iPad 1.0 offers a far more simplistic home page, which Google derided as being just "a warehouse full of apps" in its presentation. Google's presenter said Honeycomb tablets have a desktop that is "an application development platform in itself," using the same widget mini-apps that appear on Android phones. One drawback to existing Android widgets is that they often constantly poll for data, eating into battery life. Apple designed iOS devices to do very little until the user actually launches an app, enabling an exceptionally long battery capacity. Apple pursued a similar strategy with iPods, dimming the screen and effectively coasting as much as possible to preserve battery life while playing music. Competing devices, including Microsoft's Zune, chose instead to present graphic effects that made for good demonstrations but were ultimately just impractical. A key feature of last year's Android 2.1 was Live Wallpapers, which similarly animate the background for cool effects that require illuminating the screen to even see, identically favoring frills over battery life. One reason why Windows Tablet PCs haven't ever gained traction with users is their poor battery life. Google said it had spent a lot of time optimizing graphics performance in 2D and 3D, and demonstrated new API support for hardware accelerated user interface animations intended to deliver "overall polish," similar to the LayerKit API that first debuted on the original iPhone in 2007 and which later made its way to the Mac OS X Leopard desktop as Core Animation. A lack of consistent hardware accelerated UI support in Android is blamed for its jerky and lagging experience, a particularly notable problem on the Android 2.2 Froyo-based Samsung Galaxy Tab. Android's new RenderScript drawing API was demonstrated by opening the eBook app and turning virtual pages using the same page turning effect Apple showed off a year ago when it launched the iPad, but the effect was presented as if it had never been seen before on a tablet. Android 3.0 Honeycomb also delivers some features Apple's iPod 1.0 doesn't, including support for features of Google Maps 5.0 (including elevation views with 3D buildings), a popup notification system that presents update notices similar to the Windows taskbar, a very complex camera app, and support for GoogleTalk video messaging, something similar to Apple's FaceTime in iOS 4.0 but which is not exposed on iPad 1.0 because, like most Android smartphones, it lacks a front facing camera. Google's presentation was short on technical details, including whether or not GoogleTalk might be compatible with FaceTime. The new Android release also catches up in some respects to iOS 4.0 in adding support for some basic new enterprise policy management features, HTTP Live Streaming and an "extensible DRM framework" that should enable Android users to use apps that make use of protected content such as Netflix. On page 2 of 2: Focusing on a market that doesn't yet exist, Android Market on the web.